If you experience dental anxiety, you’re not alone. Millions of Americans put off important dental treatments out of fear and anxiety. Unfortunately, skipping your regularly scheduled checkups and dental cleanings can result in the development of serious oral health problems down the road. In many instances, the treatments required to address these issues are much more painful and expensive than your regular checkups. Dr. Frank is always looking for ways to help his patients enjoy a relaxed, comfortable experience at our Hoboken dental office. For years, sedation dentistry has been the primary option available to patients experiencing dental anxiety. While sedation dentistry achieves great results, it’s not right for everyone. That’s why Dr. Frank has started offering NuCalm® as an all-natural alternative to sedation dentistry. This page will provide you with some basic information about the NuCalm treatment, but the best way to determine if it’s right for you is to speak with Dr. Frank in person. Please call 201-792-9400today to schedule a NuCalm consultation at our Hoboken cosmetic dentistry office. NuCalm is an innovative all-natural neuroscience technology that will help you enjoy a more relaxed and comfortable dental appointment. This treatment is extremely effective and enjoys a very high satisfaction rate. More than 300,000 dental patients throughout the country have tried NuCalm, and roughly 98% of them said they would recommend it to others with dental anxiety. Your NuCalm treatment will help you achieve a state of deep relaxation throughout your dental procedure. Our team will administer NuCalm to you when you arrive at our office, and you’ll slip into a state of relaxation within a matter of minutes. Since NuCalm is all-natural, there are no side effects, impairments, or recovery time. 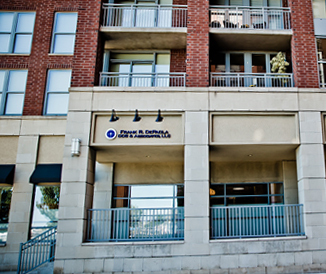 As a result, you can leave our office as soon as your procedure has been completed. Step 1 – Dietary supplements containing all-natural ingredients are administered to interrupt stress. These supplements won’t interfere with any other medications you’re taking or dietary restrictions you may have. Step 2 – Patches are placed behind your ears to provide microcurrent stimulation that helps facilitate relaxation. Step 3 – Listen to soothing music through headphones. The music is specially constructed using neuroacoustic software that helps place you into a deeply relaxed state. Step 4 – A special light-blocking eye mask removes all visual stimuli in order to help you maintain your relaxed state. We all deal with multiple stressors on a daily basis, and NuCalm is a great way to help you reduce the stress in your life. The deep relaxation you experience when you use NuCalm helps your body recover from the damage caused by the chemicals released when you’re stressed. As a result, the benefits of NuCalm extend way beyond helping you relax in the dental chair. Please contact the Practice at Maxwell Place using the form at the right side of the page or call 201-792-9400 today to find out how NuCalm can improve your next dental experience. 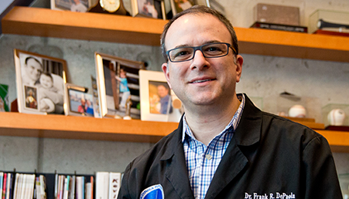 Dr. Frank DePaola serves patients in Hoboken, Jersey City, and Hudson County, New Jersey.